As everybody was continually complaining about the destructive power which had occupied the place, the divine Spirit came upon Daniel and he called to mind that great man, Anthony, the model of asceticism [and Paul, his disciple]; he remembered their struggles against demons and the many temptations they suffered from them and how they had overcome them by the strength of Christ and were deemed worthy of great crowns. Then he asked a man who understood the Syrian dialect about this church and begged him to show him the spot. On reaching the porch of the church, just as a brave soldier strips himself for battle before venturing against a host of barbarians, so he, too, entered the church reciting the words spoken by the prophet, David, in the Psalms: 'The Lord is my light and my savior, whom shall I fear? The Lord is the defender of my life, of whom shall I be afraid?" (Ps. 27:1) and the rest. And holding the invincible weapon of the Cross, he went round into each corner of the church making genuflections and prayers . When night fell, stones, they say, were thrown at him and there was the sound of a multitude knocking and making an uproar; but he persevered in prayer. In this way he spent the first night and the second; but on the third night sleep overpowered him, as it might overtake any man bearing the weakness of the flesh. And straightway many phantoms appeared as of giant shapes some of whom said, "Who induced you to take possession of this place, poor wretch? Do you wish to perish miserably? Come, let us drag him out and throw him into the water!" Again, others carrying, as it seemed, large stones stood at his head, apparently intending to crush it to pieces. On waking, the athlete of Christ again went round the corners of the church praying and singing and saying to the spirits, "Depart from hence! If you do not, then by the strength of the Cross you shall be devoured by flames and thus be forced to flee." But they made a still greater uproar and howled the louder. But he despised them and taking not the slightest notice of their uproar, he bolted the door of the church and left a small window through which he would converse with the people that came up to see him. In the meantime his fame had spread abroad in those regions, and you could see men and women with their children streaming up to see the holy man and marveling that the place formerly so wild and impassable lay in such perfect calm, and that where demons danced lately, there by the patience of the just man Christ was now glorified day and night. Now the priests of the Church of the Archangel Michael lived nearby and they were simple folk. So when the envious demon who hates the good saw such victories gained through the power of Christ, he was mad with rage and suggested to the minds of the priests an argument that ran like this: "It is no good thing that you are doing in letting the man dwell there; for just look how all the world goes to him and you in consequence remain with nothing to do. You had better go to the city and say to your bishop, 'Some man, come from we know not where, has shut himself in near us and he is attracting people to him, although he is a heretic. But he is a Syrian by birth and so we are unable to hold converse with him."' Having reasoned thus among themselves the priests went in and reported the matter to the man who was then the bishop, namely the blessed Anatolios, the Patriarch of Constantinople. But the Archbishop said to them, "If you do not understand his language, how do you know that he is a heretic? Leave him alone, for if he has been sent by God he will be established; but, if it is otherwise, he will go away of his own accord before you chase him out. Do not bring a scandal upon us and yourselves." With these words he dismissed them. And they went home and kept quiet for a time. But when the demons saw that they were accomplishing nothing, they again rose in rebellion against the servant of God and brought phantoms before him, carrying, it is said, naked swords, and crying, "Whence have you come, man? Give place to us for we have been living here for a long time. Do you wish your limbs to be cut in pieces?" And then, it is said, they came towards him with their swords and spoke again saying to one another, "Do not let us slay him, but let us drag him along and cast him into the water where we sank the ship." And they made as though they would drag him away. But the servant of God arose, and after uttering a prayer he said to them, "Jesus Christ my Saviour, in Whom I have trusted and do trust, He will Himself drown you all in the deepest abyss." A great howling arose and they flew round his face like a swarm of bats and with a whir of wings went out of the window, and so he drove them all forth by the power of God through prayer. The Devil, seeing that once more his ministers had been routed, again stirred up the priests to go to the Archbishop; and they said to him: "Master, you have authority over us; we cannot bear that man, bid him come away from that church, for he is an impostor." Then the blessed Anatolios sent the officer of the most Holy Church with the deacons and in the night they burst open with crowbars the door which the Saint had closed and brought him to the City. When the Saint was brought before the holy and blessed Anatolios in his palace, the Archbishop asked him "Who are you? And whence have you come to these parts and what is your belief? Tell us." And the servant of God declared his blameless faith by means of an interpreter and the blessed Anatolios stood up and embraced him and besought him to remain in the palace, but the men who had brought him he dismissed, saying, "Go, hold your peace, for I find great edification in this man." So they left him there in the bishop's palace and went their ways. In the meantime the Bishop fell into a very severe illness, so he sent for the holy man and begged him to offer prayers on his behalf that he might be freed from the illness. And, since it so pleased the Divine Power, after the Saint had made his prayer, the Bishop was cured of his illness by God's good pleasure. Thus the words of the psalm were fulfilled towards the Saint: "He will perform the desire of them that fear Him, He also will hear their cry and will save them" (Ps. 114:19). After the Bishop's recovery the servant of God asked to be allowed to depart; but the Archbishop would not agree thereto and said, "I wish you to live with me." Then he again begged to be allowed to go, and asked him to grant pardon to the men who had slandered him to the Bishop, for the latter was threatening to excommunicate them. And the Bishop said, "I must ask pardon of you, servant of God, for your arrest, but God has made your presence here a great blessing to me, for if your holiness had not settled there, I should certainly have departed this life." He also implored him to let him build a cell for him saying, "Since I am unable to persuade you to live here with me, if you will let me I will build you a small monastery, for our most Holy Church has many a suitable spot in the suburbs of the city. Go out and look at them and whatever pleases you, I will give you." But the holy man replied, "If you really wish to do me a service, I beseech your Holiness to send me to the place to which God led me." Finally the Bishop bade him be taken back with great respect and settled in the aforementioned church. Then the people could be seen flocking to the holy man again with joy and delight and many were granted healing so that all marveled at the merciful grace of our Master Christ which He poured out upon His servant. And even those who had formerly wished to persecute him did not cease serving him and in all ways caring for the holy man. And he did as he had done formerly - he bolted the door and left only a small window open through which he spoke, instructing and blessing the people, as I said before. After a space of nine years had elapsed, the servant of God fell into an ecstasy, as it were, and saw a huge pillar of cloud standing opposite him and the holy and blessed Symeon standing above the head of the column and two men of goodly appearance, clad in white, standing near him in the heights. And he heard the voice of the holy and blessed Symeon saying to him, "Come here to me, Daniel." And he said, "Father, father, and how can I get up to that height?" Then the Saint said to the young men standing near him, "Go down and bring him up to me." So the men came down and brought Daniel up to him and he stood there. Then Symeon took him in his arms and kissed him with a holy kiss, and then others called him away, and escorted by them he was borne up to heaven leaving Daniel on the column with the two men. When holy Daniel saw him being carried up to heaven he hard the voice of Saint Symeon, "Stand firm and play the man." But he was confused by fear and by that fearful voice, for it was like thunder in his ears. When he came to himself again he declared the vision to those around him. 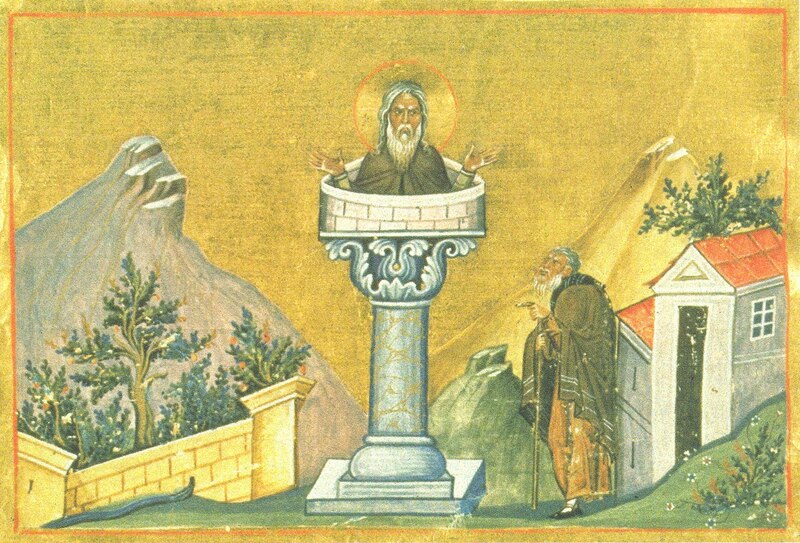 Then they, too, said to the holy man, "You must mount on to a pillar and take up Saint Symeon's mode of life and be supported by the angels." The blessed one said, "Let the will of God, our Master, be done upon His servant." And taking the holy Gospel into his hands and opening it with prayer he found the place in which was written, "And thou, child, shalt be called the prophet of the Highest, for thou shalt go before the face of the Lord to prepare His ways" (Luke 1:76). And he gave thanks and closed the book. Source: Three Byzantine Saints: Contemporary Biographies of St. Daniel the Stylite, St. Theodore of Sykeon and St. John the Almsgiver, trans. Elizabeth Dawes, and introductions and notes by Norman H. Baynes, (London: 1948).